- Build, strengthen and tone your pectorals in a controlled, effective and safe way with the Exigo Chest Press Machine. 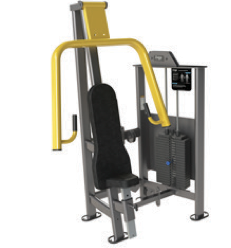 - This Machine is part of our selectorized upper body range, used to bolster strength training. The ergonomic design provides a natural feel of movement and keeps you in a comfortable yet safe position throughout the whole range of motion. - Selectorized machines are perfect for targeting specific muscles, and can be used to aid recovery after injuries or surgery and prevent joint problems as well as strengthening muscles.